Source: The Diabetes Cookbook/Diabetes Forecast. Recipe Credit: Lara Hamilton & Jennifer Lamplough. Photo Credit: Photography by Terry Doran; Food Styling by Skyler Myers; Styled by Stacey Heston. Don't toss the extra turkey after a holiday meal. 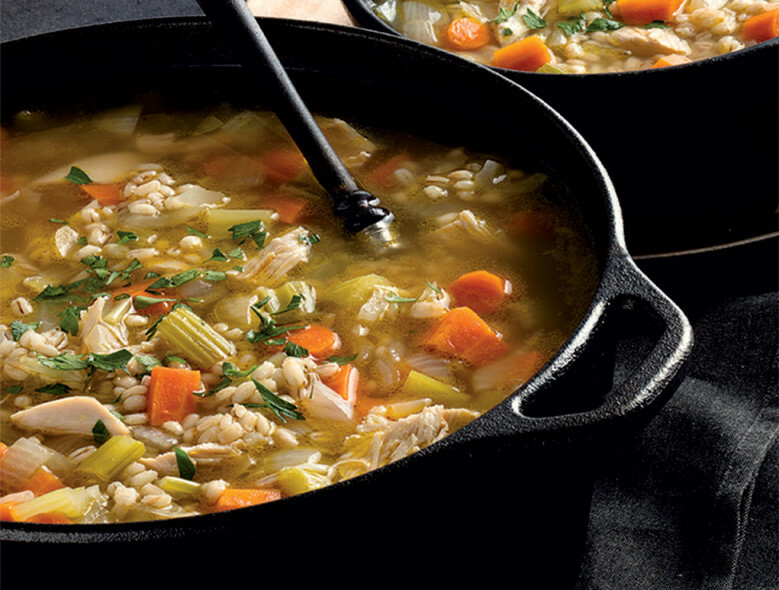 The leftovers make a great addition to this hearty, broth-based soup. Add the olive oil to a soup pot over medium-high heat. Add the onion, carrots, celery, and mushrooms to the pot. Sauté for 8 to 10 minutes, or until the onions start to turn clear. Add the barley, broth, and water. Bring to a boil, then reduce the heat and simmer for 15 minutes. Add the turkey. Season with the salt and pepper. Cook until the turkey is heated, then serve.